Adding Color to A Living Room Things to Do in Brevard County This Weekend: 04/12 to 04/14 5 Ways to Get To Know The New Area You Are Relocating To Charolais Estates in Viera Florida Things to Do in Brevard County This Weekend: 04/05 to 04/07 What Color Kitchen Cabinets are Timeless? 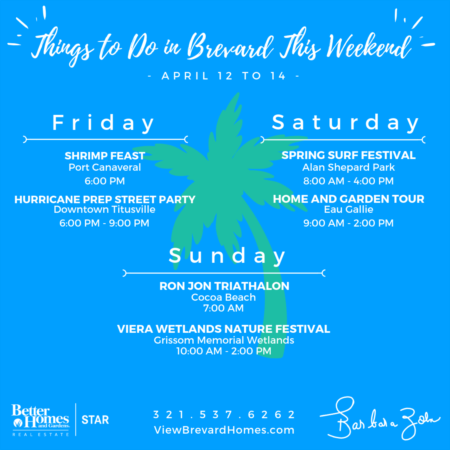 Things to Do in Brevard County This Weekend: 03/29 to 03/31 February Real Estate Market Report for Brevard County Florida Things to Do in Brevard County This Weekend: 03/22 to 03/24 Things to Do in Brevard County This Weekend: 03/15 to 03/17 The Woods At Crooked Mile Grand Haven Viera - Another Home Sold By Barbara Zorn Things to Do in Brevard County This Weekend: 03/08 to 03/10 Things to Do in Brevard County This Weekend: 03/01 to 03/03 Banana Bay Condominiums & Townhouses Cocoa Beach Brevard County Real Estate Market Update Ending January 2019 10 Quick & Easy Ways to Boost Curb Appeal Things to Do in Brevard County This Weekend: 02/15 to 02/18 Things to Do in Brevard County This Weekend: 02/08 to 02/10 Catalina Isles in Merritt Island, Florida Things to Do in Brevard County This Weekend: 02/01 to 02/03 Tips On Marketing To Millennial Beach House Buyers Things to Do in Brevard County This Weekend: 01/25 to 01/27 December Real Estate Market Report for Brevard County Florida Things to Do in Brevard County This Weekend: 01/18 to 01/21 Beach House Buying Mistakes To Avoid Finding Fixer Upper Homes for Sale: Can You Afford the Renovations? Things to Do in Brevard County This Weekend: 01/04 to 01/06 “Space Coast” Real Estate Things to Do in Brevard County This Weekend: 12/28 to 12/31 Things to Do in Brevard County This Weekend: 12/23 to 12/25 Is It Real Estate As Usual? Slow in the Holiday Months- November-December and Picks Up in the January or Are We in for Changes? Brevard County Real Estate Market Update Ending November 2018 Things to Do in Brevard County This Weekend: 12/14 to 12/16 Why Visit A Home Before Buying Things to Do in Brevard County This Weekend: 12/07 to 12/09 Things to Do in Brevard County This Weekend: 11/30 to 12/02 Looking for an Environmentally Conscious Neighborhood where squirrels, turtles, fish and birds are you neighbor? Capron Ridge is the Place to Be! Florida’s Hottest Beach Town: Indialantic Things to Do in Brevard County This Weekend: 11/22 to 11/25 Brevard County Real Estate Market Update Ending October 2018 Things to Do in Brevard County This Weekend: 11/16 to 11/18 Cocoa Beach Condo, Or House? Things to Do In Brevard County This Weekend November 9-11,2018 Essential Housing Metrics to Follow When Selling Your Home 'Space Coast' Beach House Local Secrets: Cocoa Beach Things to Do In Brevard County This Weekend Brevard County Florida This Weekend October 26, 27 and 28 Maintaining A Beach House Looking for a Reasonable Priced Riverfront Condo? The Castaway Cove Will Fit Your Budget! September Real Estate Market Report for Brevard County Florida Picking Your Perfect Beach House 5 Things To Do Before Your Showing Buying A Beach House The Seasons Of Cocoa Beach Six Benefits of Life in Cocoa Beach Why You Should Consider Selling in the Winter Is Getting a Home Mortgage Still Too Difficult? Common Things to Look Out for Before Buying Your Dream Home Will Increasing Mortgage Rates Impact Home Prices?